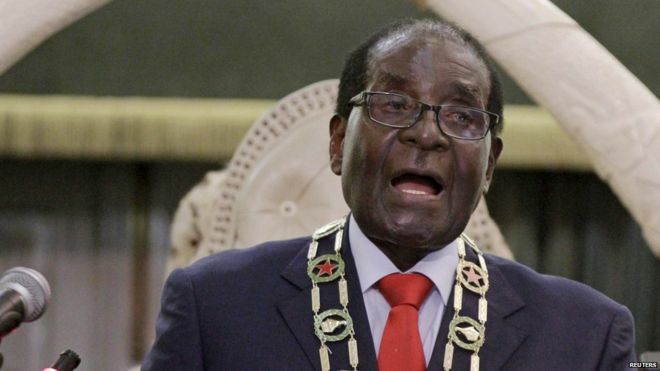 ZIMBABWE – President Robert Mugabe’s order to ministers to remove over 200 families, mostly Zanu PF supporters in Harare South, from an illegal settlement near the Harare International Airport has invited scorn from the settlers. The residents, who have been given until Tuesday to relocate after Mugabe raised objections to their settlement, told The Standard yesterday they were ready for a battle with authorities to protect their properties which they claim to have bought from government. Mugabe last week ordered his Cabinet ministers to clear off the area, saying the settlement was an eyesore and situated in an area meant for airport expansion. But the residents were defiant and some were yesterday still building their houses, some of them so big they could be classified as mansions. Titus Runesu is building a medium-sized house which is now at roof level about 200m away from the airport road. Runesu said while Mugabe might have a genuine concern about the developments, his government was to blame as they allowed them to build the houses and even approved their building plans when they were aware that the land on which they were settled was not suitable. “We did not allocate ourselves this piece of land. Government in 2005 gave us this land and we have been here since then; so for them to come today and want to remove us is surely an injustice,” he said. On Friday, government dispatched Miriam Chikukwa (Harare Provincial Affairs minister) who was in the company of Harare South MP Shadreck Mashayamombe to engage the people so they could be relocated to Retreat Farm in accordance with Mugabe’s directive last week. The settlement is being administered by Nyikavanhu Housing Cooperative. While there are many proper houses that have been constructed or are under construction, the site gives a view of a haphazard “squatter camp” as it is largely composed of makeshift structures. Mugabe, who was cutting the ribbon to officially open the first phase of the Harare International Airport Road last week, looked at the settlement and was not impressed. He said the settlement tarnished the image of the country and the settlers should be immediately relocated. Mashayamombe said the settlers have until Tuesday to start moving their properties and raze down their structures before being resettled at Retreat farm in Waterfalls. “They will move. We are engaging them and we are hopeful that they will go to a suitable place which is convenient for them as well as government. This is a directive from the president and we can’t ignore it,” Mashayamombe said. “We have identified land for relocation and they have Monday and Tuesday to start moving from that area. Although some of the settlers are genuine members of the housing cooperative, Mashayamombe said there were many others who were illegal occupants. He said most of these had just moved onto the farm from Epworth. But the residents in question said; “today we are illegal but during election time we were important”. The Airport Road settlers are among many other Zimbabweans who have been duped by Zanu PF officials and land barons taking advantage of their desperation especially during election times. When The Standard visited the area on Friday afternoon, most of the settlers looked unsettled and worried. The government officials, including the provincial minister and local MP had come to address and advise them of their impending relocation. “It’s tricky my brother that we have to leave this area considering circumstances that surrounds our stay here. “We came here because of Zanu PF but we are now being told to leave the area by the same people. Anyway I can’t say much to you guys. “We will see how to handle the situation,” said one Petros Kavhukatema as he walked out of the meeting that had been addressed by Chikukwa. Some of the settlers, especially those that had just put up makeshift structures could be seen pulling down their ‘houses’ while others declared they were determined to fight. As The Standard news crew drove through the settlement in the afternoon yesterday, grief stricken settlers appeared suspicious of strangers and refused to give interviews. One of the women leaning against the wall of her hut asked the motive of the news crew. “What are looking for here? This is not a playing ground my brother, there is no through road near my house go back and use the other road,” the woman shouted in anger. Zanu PF linked housing cooperatives control most of the new settlements around Harare and some of the so-called land barons were arrested early this year.